Myoporum species such as Myoporum parvifolium are also known as Creeping Boobialla. Two forms are available, a prostrate shrub or ground cover plant Myoporum Boobialla will form a dense mat and will trail over rock or retaining walls. The taller form can reach a height of nearly 1m as it mounds up and could also be used as a low hedge. The flowers are scented, the fine foliage forms a dense mat and this low maintenance plant is not only drought tolerant, it also acts a weed suppressant. Grow it in the general garden border, as a part of a rock garden or even as a ‘no traffic’ lawn substitute for a nature strip or besides an driveway. Creeping Boobialla also grows well in coastal conditions and sandy soils. It is probably not at its best between pavers as it gets a little tall for this and could be trip hazard. All species flower from late october through to early December. Small flowers with feathery panicles dangling below create impact. A well drained soil and a position in full sun to part shade is best. Some species are ground cover plants while others will grow to 2-3m. All species prefer a well drained soil. Best grown in full sun and in a well drained soil. This is a plant that will benefit from regular pruning to help maintain a compact bushy growth habit. This is a fast growing plant, so very useful in establishing new gardens. The best time to prune is in early spring, or immediately after flowering in late summer. Improved cultivars such as M. parvifolium ‘Yareena’ are also available. Myoporum are commonly referred to as ‘Boobialla’, however with a wide range in the species it is worth investigating further. M. parvifolium is often referred to as ‘Creeping Boobialla’, it makes a good ground cover and comes in a fine leaf and a broad leaf form..
M. viscosum is the ‘Sticky Boobialla’. M. acuminatum or ‘swamp boobialla’. Myoporum bataea is a popular variety. M. insulare is a more upright shrub well suited to coastal conditions. Myoporum insulare is referred to as the ‘Coast Boobialla’ the waxy leaves make it salt tolerant. 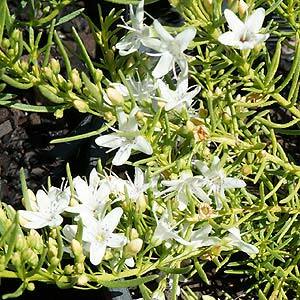 With scented white leaves and large purple fruits that are used as a bush tucker food.